Welcome to the newest page on our website! 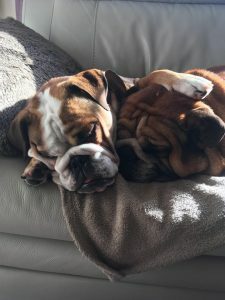 We have one of the best reputations in the bulldog community, we often keep in touch with owners of our puppies some of which have become good friends. 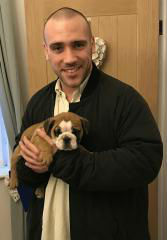 We have many people coming back to us for more puppies & recommending us to friends. If you have had a puppy from us & would like to leave a testimonial please email me. 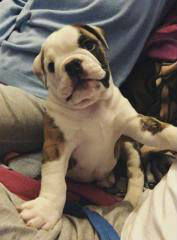 ‘Iggy’ our puppy is the the most amazing english bulldog- 100 percent healthy, nice and chunky and absolutely stunning! Everyone that sees her compliments her and how amazing she looks! Not only have we got the most amazing addition to our family but Martin genuinely cares and is always there to answer any questions and give advice! 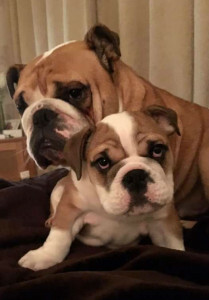 “We are now the owners of 2 Bulldogs, Boris (aged 4 years) and Floyd (aged 10 weeks). We’d wanted a British Bulldog for a while, but were hesitant to rush in, with lots of Breeders and differing tales we were eventually put on to Martin at British Gold by one of the countries top breeders, who’d recently retired from the game. 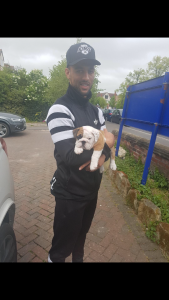 Even though they weren’t the nearest for us being in Derby, we travelled over to see Martin’s Stud Dog Louie, and from there it was love at first site and we were destined to get our Dog from British Gold. Martin has been a great source of advice throughout the last 4 years since we first picked up Boris and I would now class him as a good friend. Always available to help with advice on our family pet, whether it be Health, Nutrition, Finance etc. The fact that we went back to get our second Bulldog Floyd says it all. 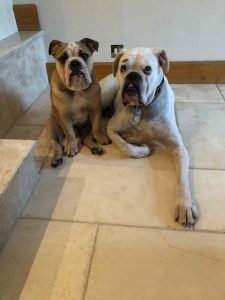 “We were looking for a British Bulldog to join our family for well over a year before we approached Martin Mosley owner of Britishgold Bulldogs. After discussions and meetings with Martin we were filled with confidence that Britishgold was the right choice for us. The friendly advice and professionalism was outstanding.